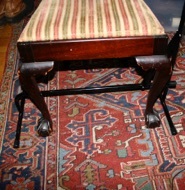 Lectern swings to either side of chair, desk, sofa, or bed when not in use. (not for use with printed books). Tilt of lectern adjusts. Easily adjust distance from eyes. Height adjusts. Base of unit is specially designed to stay out of the way, under your chair, desk, or bed. This unit takes up no extra floorspace. This unit will work with office swivel chairs, recliners, all standard 4-leg chairs, arm chairs, and lawn furniture, as well as your desk, sofa, and bed. Width of base adjusts for different chairs. Special model for wheelchairs. Cross your legs any way you want. No need for pillows. Your Feet and legs are always completely free in front of your chair, or sofa. Use an external keyboard on your lap for typing. This unit is a high-tech design made with a lightweight, aluminum frame, with silver color (only choice now). The Lectern is made with 1/4” clear plexiglas, with edges hand flame polished. Current Height of base crossbar between legs is only 1.5”. 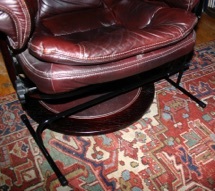 This is ideal for swivel chairs and sofas. 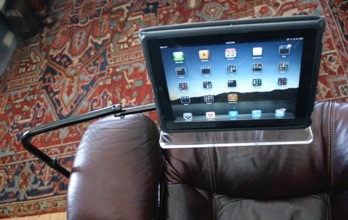 The triangular frame support creates a stable design for touching the iPad screen. This design prevents the Lectern from wobbling up or down. In addition, an adjustment screw on the vertical riser keeps the Lectern from swinging freely forward or back. You adjust this screw to your individual preference. This adjustment also stabilizes the screen when you touch. You can easily change the pole configuration, so the upright pole and lectern are on the opposite side (See our Directions for Setup and Operation below). The unit comes with the vertical pole configured to be on the left of your chair, sofa or bed. The unit comes apart easily to fit in a standard suitcase along with your clothes. Shipping box is 20” X 14” X 3”. 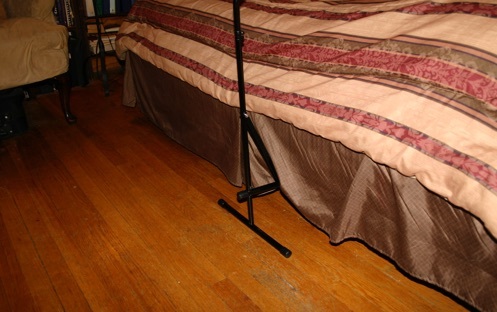 Be sure to tighten the upper hose clamp on the pole as much as you want to keep the lectern from swinging freely. Made in Beverly, Massachusetts, USA. 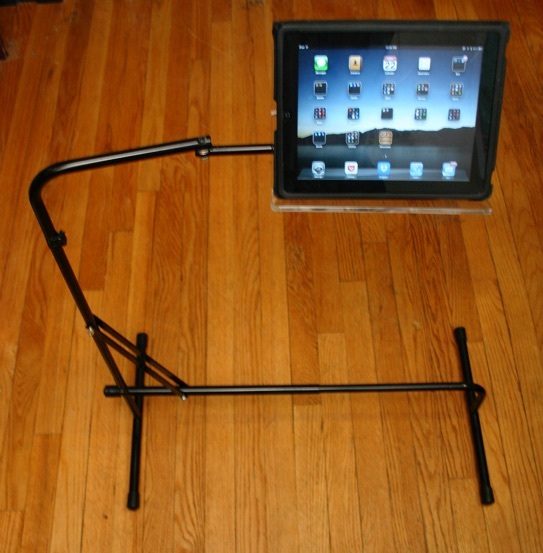 Cost of the iPad Floor Stand with Standard Lectern is $129.00 and $16.00 shipping anywhere in USA. This is a highly engineered stand that works very well. Be sure to set it up and operate it according to the directions below. 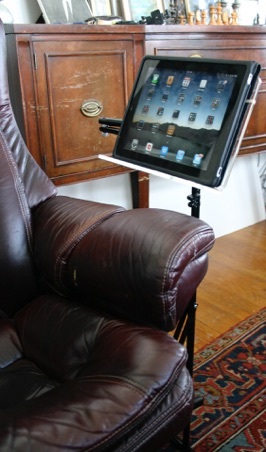 Most of our clients have medical issues and want a high performance stand with lots of adjustability. 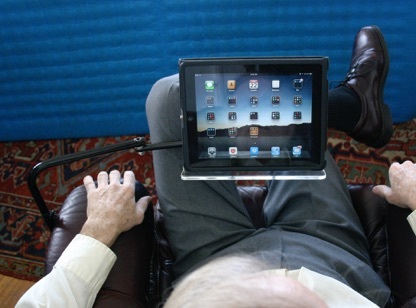 This unit is meant for viewing iPads and Tablets. It is not meant to hold books, or be a desk for typing on or writing on. We have other products for holding books of all sizes (also see below). Call with any questions, or to order over the phone: 978-927-9234. You can also E-mail us at proread@tiac.net. This unit provides instant help for Seniors, Low Vision, Physical Challenges (like stenosis, arthritis, and shoulder, neck and back pain) and all students and adults wanting to improve their concentration, focus, reading time, and reading enjoyment. We offer a 30 day Satisfaction Guarantee. If you are not completely satisfied, you may return the unit within 30 days for a full refund of product cost. This does not include initial shipping cost. You must pay return shipping. After receiving the unit, we will examine it, and if there is no damage, we will issue a refund. Please consider calling us if you have any problems setting up or using this unit. We can almost always help you right away. Learn How to Greatly Improve Your Reading Enjoyment, Comprehension and Speed by reading silently just ahead of computer voice, first at normal speaking speed, then at 350 words per minute, and then at 500 words per minute and above. Our iPad Floor Stand will enable you to instantly increase your focus, concentration, reading time, comprehension, and enjoyment. 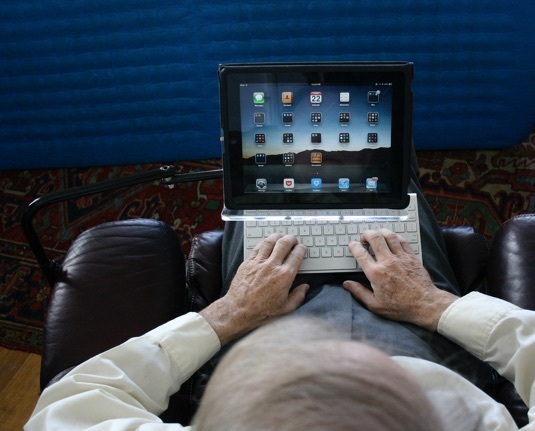 The key to all this is to sit back comfortably and read with the screen at one height and distance, and the keyboard at another height and distance. You can’t focus and concentrate if you are uncomfortable, or experiencing neck, back, or shoulder pain, or eye strain.